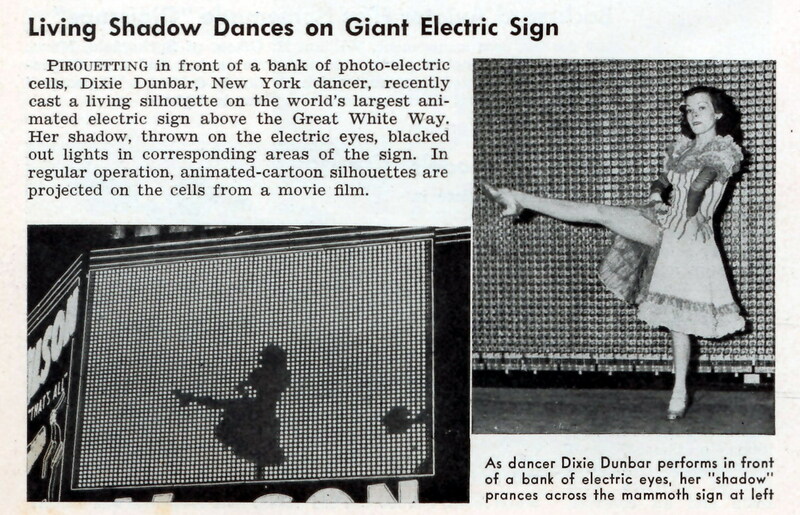 PIROUETTING in front of a bank of photo-electric cells, Dixie Dunbar, New York dancer, recently cast a living silhouette on the world’s largest animated electric sign above the Great White Way. Her shadow, thrown on the electric eyes, blacked out lights in corresponding areas of the sign. In regular operation, animated-cartoon silhouettes are projected on the cells from a movie film. It would be interesting to find out how the “The Zipper” formed the characters in lights before digital electronics existed. Paper tape? Maybe physical metal letters on a chain dragged over electrical contacts?